*Free Shipping to the Continental U.S.
NEMCO's french fry potato cutter with new wavy ribbon fry cutter! Fresh fried potato wavy ribbon fries make a savory, healthful, high-value presentation that customers love. 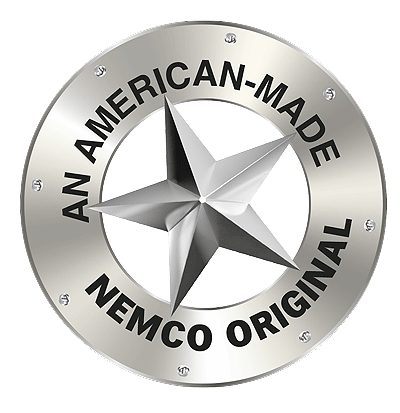 NEMCO's Fry Cutter lets you turn potatoes into platefuls of uniquely appetizing, fresh wavy ribbon fries (similar to house-made potato chips) that serve up big profits for you. Simply load a potato and turn the easy-action screw drive. No peeling required. Easily releases and retracts for fast reloading. Mounts securely on any flat surface for left or right-handed operation. Perfect for creating signature-item appetizers, this french fry cutter is a great choice for the bar and lounge too! 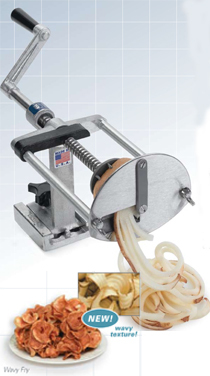 NEMCO's Potato Cutter affords you the highest profit on every serving in your restaurant. For example, with a per serving food cost of only $0.30 and a $2.00 selling price, your per serving profit of $1.70 will make the potato cutter your biggest moneymaker ever. Preset drive depth protects blades from contact with metal parts. Heavy-duty construction adds durability and long life. Mounts securely on any flat surface for left or right-handed operation. Removes easily for quick cleanup - just loosen the mounting nut, slide out and rinse. Our Commitment to Customer Service Get to know ABestKitchen for easy ordering and superior customer service. Call us at 330-535-2811 to talk to an account manager. ABestKitchen is the original online kitchen equipment company. Selling online since 1998, we stock thousands of commercial quality foodservice products. We're not the biggest, but we're the best. Need help? Our experienced staff is available to help select the best product to suit your needs.